While visiting Syria we drove up to Ma'aloula and Sidnaya - two small towns in the hills that ridge right along Syria just before the serious mountains of the Anti-Lebanon Range. I have always heard this term spoken and had never been sure if it was neant to be Ante-Lebanon as 'before' Lebanon or Anti as in 'against'. Even the internet seems uncertain - I have just checked and found credible sites using both. Perhaps in the last few years Anti is better. The car wound its way out and up from Damascus, heading steadily north. The rocks that ridged the hill seemed a long way away at first but slowly we seemed to get closer to them - a long scree-covered range of hills (can you have a range of hills? )with a heavy vertically ridged outcrop that crusted the top. Obvious rock falls from time to time showed as long trails of very large rocks on the slopes. Now and again an obvious overhang had my fingers itching to go and search for worked flints - Syria has a lot of caves where early man could shelter, and there is often evidence of tool making in the area. 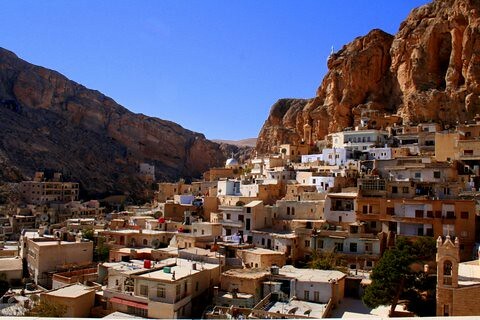 Ma'aloula settles tightly into the mountains. There is a story that one of the early saints of the Christian Church was a young girl whose name was Tekla, or Tecla or Taqla. She was pursued and persecuted for her Christian faith (this seemed to happen so often that it is a wonder there are not a lot more saints) and chased into these hills. 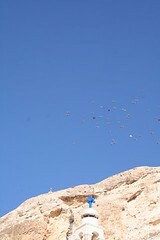 In prayer she asked for a refuge and a part of the rocks in the hill opened into a cave to hide her. On top of the hill is a church of St Sergius and this is really interesting. It dates back to the time before Christianity was fomalised with the Nicaean council and creed in 325. At this time it was decreed that no sacrifices were to be made in Christian churches and from this point altars in churches had a smooth flat top. There are two altars in St Sergius, and both have high rims to prevent the spilling of blood in a sacrifice. The original entrance to the church must be a door all of about four feet high - to guarantee that you bowed your head towards the altar as you entered. 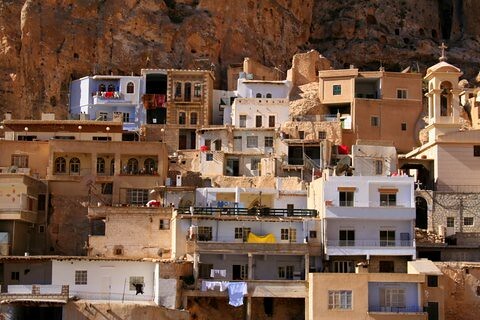 In both Ma'aloula and Sidnaya the language of the time of Christ - Aramaic - is still spoken. I often wonder if Mel Gibson wandered around here conferring with older locals to brush up his language for The Passion of Christ. I suspect that the use of Aramaic is not as widespread now as the locals would like you to think. However there was one point where the lovely young woman who was the guide for the church stood and said the Lord's Prayer in Aramaic and it was hard for even the toughest cynic to stay unmoved. I have it on video as this was permitted but do not think my Flickr website that shares images for the blog will support video. In Sidnaya the Monastery sits heavily on a rocky hill and looks more like a fortress than a Christain site. Carved straight into rock as you drive around the hill on the encircling road is a series of beautiful niches - almost door-sized and topped with a scallop shell arch. No photos I am afraid - we were being monstered by a bus and could not stop. My mother looked a bit horrified at the four flights of steep steps that zigzagged up the front of the monastery. I could almost hear the words "I'll stay in the car" shaping in her mind, when the driver pointed out a lift. 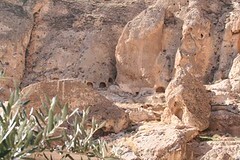 This monastery was the most popular site for Pilgrammage other than Jerusalem in early Christianity. for those interested in this period William Dalrymple's From the Holy Mountain is wonderful. 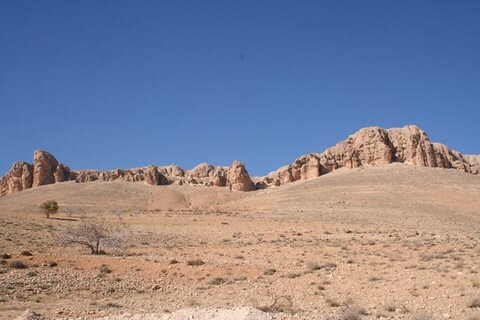 It also connects early Christian Syria with the Dead Cities of the north which I may write about soon - the photos are waiting. We climbed up through narrow stone cut alleys and passages once inside. It was dark and cool, almost chilled. The church does not actually feel all that old. There has been pleanty of money for refurbishing and repainting. The ceiling arches overhead ultramarine blue and an impression of clouds and stars. There are a lot of icons, like in St Sergius and some of these look very old. I took two steps inside and the music stopped and held me in thrall. There was a breathtaking moment when I was not even sure I was really hearing it, then I wondered where the choir was. There was no obvious choir so I assumed a tape. I moved in and sat in a pew. Then I realised that the group of young people on the other side of the central aisle were singing. They were all Arab, and the young women were not veiled. Many women in the church were veiled and looked very Moslem - then I later found that this church has the local reputation of giving pregnancies to those having trouble conceiving so many Moslems come in hope. It is hard to describe how wonderful the singing was. Young men in the front seemed to be leading and one had a string instrument of some sort - possibly a guitar or oud. I could not see it without drawing too much attention to myself and I did not want to break the spell. I sat through about five songs until I could ammost feel Bob getting restless at the back of the church. The voices were all good buyt obviously not particularly trained - but mellow and soft and not in any way competing with each other. It was obviously sacred music and in Arabic, but shared some quality with Gregorian chants - a narrow range perhaps, which made it singable for most voices. Either way it was melodic and beautiful and I now have a phone number for the leader who said they are in the process of making a CD. We had stopped between the two towns to clamber through an unlocked gate. Does a twist of wire count as a lock? 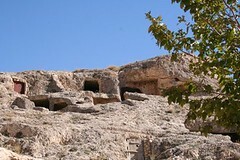 On the hill against Ma'aloula were rock cut tombs - some graffitied but still really interesting. We had seen a lot of others all around and above the main town. Some looked as if they might have doubled as dwellings for the ascetics who were in such fashion in the early days of the church. It always seemed to me to be really odd that St Simeon put himself onto a tall column of rock in the North of Syria to get away from people and startd a whole cathedral complex with supoorting monastries that climbed the hills for miles as people surged out of the region and Europe to be close to him. 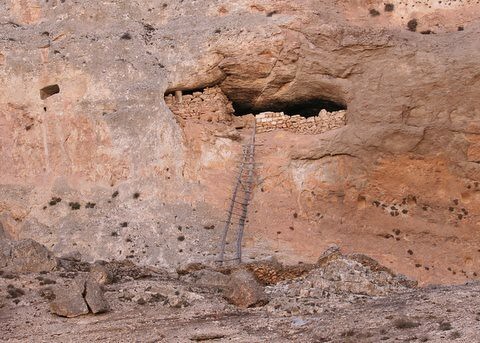 In one sheer rock face a wonderful ladder was proped against a half-closed tomb. The ladder was made in the local way - one long piece of wood - probably a straightish trunk from the length of it was split lengthwise. Then smaller branches were inserted at intervals to create the steps. It looked so difficult to climb that I could not believe that anyone would bother to brick in the cave - but then, I don't much like heights. Then the others questions started - why would you brick it in unless you wanted to live here, or to store something that might be damaged if it got wet. 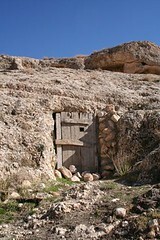 Could it be to keep goats in the cave or tomb? Can a goat climb a ladder? We ate a superlative lunch. Syria must have the best food in the world and we were groaning when we left. It is THE thing to do on a Friday - to leave the city and drive into the hills and eat lunch at a truly superb restaurant. The profits of a good Friday are so lucrative that restaurants of the region vie with each other for the best and freshest food. We came back along different ridges through Bloudan and Zebdaneh and hit heavy traffic. We might have started the day with a search for the sacred sites, but it definitely ended with the secular! Jenny - I really admire you and your mum trekking around. It always sounds like just leaving the house is such an adventure but on the other hand - you have them when you are at home too! Your pictures are breathtaking. Thank you for your blog. You are opening the world tenfold. Thank you for some wonderful pictures. The Middle East is one part of the world that has always fasacinated me. Many years ago I had the chance to work on a kibbutz but circumstances intervened. One day I will visit that part of the world. If possible, perhaps you could download your video to You Tube or something similar. There are a few free video sites where you can store your videos for free. I would be very interested in seeing it. This sounds like a wonderful experience- I need details for when I go.... Would love to see these towns and early churches. And you can probably post your video on You tube. I always feel like I've been transported to another place & time, when I read your postings. Thank you Jenny for sharing the beauty of your part of the world. It seems especially Biblical this time of year. Thankyou for taking me 'with' you on this journey.